January was such a cool month! I don't know if it is just me, but I always like the spring semester or months so much better. It's like the year is energizing itself, and you can see the promise of God to make everything new being fulfilled in some small part as all the plants start to come back to life. Anyway I hope your January went well. To start off our year in FOCUS, we had our Winter Camp. 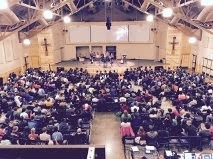 We had all of our six campuses come together for 4 days to learn about God and praise him together. It was so much fun. We had a speaker come all the way down from Canada. His name is Iain Provan, and he is an Old Testament scholar. He teaches at Regent College in Vancouver, and we've been listening to some of the audios from his and other professors from that college for years. We were shocked and excited that he agreed to come and speak. He did such a great job, too. Our theme this year in FOCUS is words of life, and every session he spoke at he revealed how the Old Testament fit into God's words of life. The interns and staff got to have a lunch with him as well, and it was so encouraging, for both him and us. Getting to see him in a more casual light just reminded me that he is just a man doing God's work, nothing more. That may sound weird, but it can be so easy to idealize a person. But he is just a man who had his own journey with God, which to me is so much more encouraging. He has impacted so many people because he listened to God. He shared with us how encouraging it was to see our community. He had no idea about us, yet here we were, listening to his audios, trying to learn more and more about who this God we follow is. Now this really neat relationship is being formed between us and Regent College. When Iain returned back home, he said he put in a good word for us with the other professors in case we wanted to ask someone else to come speak at a Winter Camp in the future! I could seriously keep going on about how great Winter Camp was. Just getting to see a few hundred college students, alumni, and adults praising God together is such an inspiring sight. I'm so glad we do it; all of the hard work needed to put that on is worth it. Lastly, but certainly not least, this month we found out some of who the new staff members will be and where they will be going! Miriam Freeman will be coming on staff and staying at UNT, Cody McCarty will be coming on staff and going to UNT, Ana Fineout will be coming on staff, and Sarah King, who is already on staff, will be going to UTA to help start that ministry! I will also be coming on staff at TWU, and I'm so excited about it. I just want to ask that you be praying for that transition, with Sarah leaving and me staying on. I'd also ask that you be praying and thinking about continuing to support me next year. That's going to be such a blessing to both you and the community of TWU for you to stay on! I'll definitely be praying about continued support for ya through next year. You rock! Thanks for sharing, Sarah. What you said about us believing lies is so true; not only our outright sin, but so often our ineffectiveness in any area of life comes from our believing a lie about ourselves. We are precious to God, and seeing that helps us get oriented in the right direction and moving toward the goals He has for us. I am also excited about you staying on our staff after your internship. It will be great to keep working with you and see how God uses you. I love you Sarah!